Squiders, it’s going to be October by the end of the week. On the one hand, October! I love October! On the other hand–where has 2016 gone? I’m not ready for it to be this late in the year! I had so many plans! So much to do! I think part of my general anxiety is that I have no separation between work and home. I could be at work at any time, and often am. There’s no sense of “work is over and now it is home time” and everything gets mixed together. This is the danger of working at home, my friends. Also probably freelancing/doing contract work in general. Anyway, long story short, I’m going to try an experiment for October. It’s somewhat along the idea of the adult coloring book craze. And that is that I’m going to try to incorporate sketching back into my normal routine. It’s something I’ve always done–something I started doing even before I started writing as a child. And I used to do it all the time. I was reminded of that recently as my mother decided to move in with my grandmother, and so I needed to go through all the stuff I’d left at her house. And a lot of what I’d left were notebooks. Notebooks full of drawings. Sure, there were illustrated stories here and there as well, but for the most past, it was just drawings. People, animals, aliens, clothes. Even through college and when I was working, I still sketched, in the margins of my notes or meeting minutes. 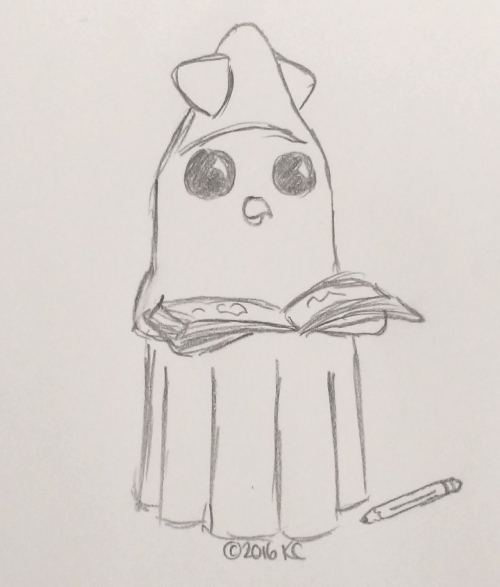 But once I started working from home five years ago I stopped, aside from the odd landsquid or specific drawing, usually related to writing somehow (such as designing uniforms or working through other worldbuilding). And so I’m going to start it back up. Maybe somewhere in my psyche, I need to sketch every now and then, to let my mind calm down and my thoughts flow more naturally. So, for October, I’m going to try to sketch on a regular basis. See how it goes. To celebrate, I drew you guys another landsquid. That’s two in one week–crazy, I know. I’m not going to just draw landsquid for the entirety of October, though. Anyway, wish me luck! Any plans for October yourselves, Squiders? 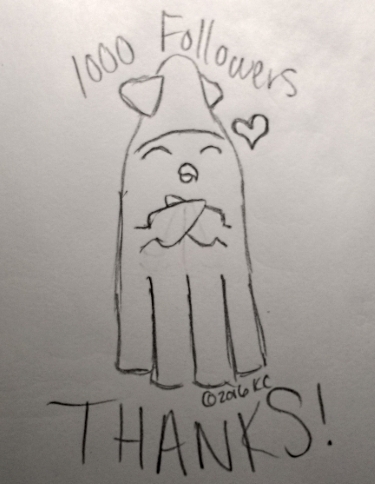 First of all, a week or so ago, this blog surpassed a thousand subscribers, so I wanted to say thank you, Squiders! If you’ve been with me for a while, I appreciate you sticking with me through thick and thin. If you’re new, welcome! Please feel free to contact me, either in the comments or through any method on the Contact Me page, and let me know if there’s anything you’d like to see more of or that you’d like me to address. As a token of my thanks, I’ve drawn you a landsquid. Now, on to Choosing Your Fate! Better known as a poll to see which of my nonfic book topics you’d like to see as a series of blog posts. I’ve found something fantastic, Squiders–a marketing videocast aimed specifically at indie speculative fiction writers. I cannot tell you how excellent this is. I have taken so many marketing courses, attended so many webinars, and read so many articles and books, and for the most part they seem to be aimed at nonfiction writers, which is a totally different animal. If they even address fiction, it’s more wishywashy, because there’s a formula you can use for nonfic and it will more or less work, but fiction is a weird and unpredictable animal and what works for some people won’t do anything for others. Speaking of nonfiction, I started my nonfiction series last January and have all of a book and a half to show for my time. I’m finding it really hard to make progress, which has been a bit baffling, because I do nonfic writing all the time for my contract positions as well as here at this blog. So I’m considering an experiment–maybe I could write a series of blog posts for one of the books and then modify and expand those to into a book. How does that sound? The book series is on writing motivation as well as basic skills like outlining, so it’s not out of scope for the blog in general. If people sound generally okay with the idea, I’ll do a poll to see which subject is most interesting to you guys. Since this obviously isn’t working for anyone, I’m thinking about revamping it, lowering the price of the reward tiers, and focusing it on a single project, so that it would be kind of a “How an Author Writes a Book” sort of thing, where patrons could watch the entire process from idea generation through to publication. I’m not sure if that’s actually interesting to people, but it seems like it would be easier to connect with than just random tidbits about a variety of projects. Thoughts, Squiders? Anything of note with you, or that you’ve seen about the interwebs? Anything really interesting that you’ve taken notice of? Well, Squiders, here we are at the end of the “trilogy.” What I find most interesting about The Adventures of Kate is that, aside from Kate, the books are completely unrelated. There are no overlapping characters or locations. I suppose T.A. Barron could have gone on forever in this vein, though Kate would have probably eventually run out of adult relatives to take her exotic places or show her exotic things. So, The Merlin Effect. Originally published in 1994. Kate states at the beginning that she’s 13 now; I feel like she’s also 13 in Heartlight. I flipped through the beginning of Heartlight again to check but couldn’t find a mention of her age, but if so it’s been a rather eventful year. Traveling through space on the back of a giant butterfly, traveling back in time to protect an ancient forest, and now hanging out with Merlin at the bottom of the ocean. I place The Merlin Effect between The Ancient One and Heartlight in terms of my own likes. I felt a little more tired of the whole Arthur legend thing this time around, but I think that’s me being burned out on it in general. Still, this is a very different take on the whole thing. Right, let’s gather our thoughts. In this book, Kate has accompanied her father to Mexico while he searches for the remains of a legendary shipwreck. Her father is a historian with a particular interest in Arthurian legend and Merlin in particular. (T.A. Barron went on to write several novels about Merlin, so I suppose this was a topic of particular interest for him.) He believes that this shipwreck may contain one of Merlin’s treasures, a horn of great, though unknown, power, and that by finding said treasure he can prove that Merlin really existed. However, there’s a giant whirlpool in the general area of where the ship–if it ever existed–went down, which complicates things, as does strange volcanic activity that another scientist staying at their camp is studying. A third scientist is studying a type of fish believed to be previously extinct, but which seems to be given eternal life here in the region by the whirlpool. Merlin and Arthurian legend is prevalent throughout, though it is interesting to see it mixed with new elements with the shipwreck and the whirlpool. Anyway, I mostly enjoyed the book, though the last few chapters leapt point of views a ton in completely unnecessary ways, in my opinion, and the question as to whether or not Terry is still alive is never answered. I don’t know if we were getting set up for another book which never happened–though even if there had been more Kate books, it seems like they would have been completely unrelated–or that particular subplot was just deemed too unimportant to bother wrapping up. But it feels weird that it was just left hanging. Have you read along with me, Squiders? What did you think of The Merlin Effect or the Adventures of Kate in general? I feel like the books have held up pretty decently over the past 20 years, which is, of course, always the danger of revisiting something you enjoyed in your youth. Most of T.A. Barron’s books are middle grade, mythology-based series, so if that sort of thing floats your boat you might want to check out the rest of his stuff. I read the first few books of his Merlin series before I dropped it, though at this point I can’t remember if I got bored or simply aged out of the intended demographic. It looks like he’s moved on to Atlantis as well. The larger, mobile one and I watched Avatar: The Last Airbender (referred to as A:TLA from here on out) a few years back, which I had heard of and had recommended many times before, and had just never gotten around to. We watched the whole thing, as well as the first season of the sequel, The Legend of Korra, which we then stopped because Korra is quite a bit more mature and there were elements that I found terrifying so I wasn’t going to show it to my small child. I mentioned something about A:TLA to him last week or so, and he didn’t remember the series at all, despite being his favorite and us reading the comments and the works. So we’re watching it again. Well, he’s watching it, and I’m watching my favorite bits, which has unfortunately included most of the third season so this week’s been a bit low on the productivity. But I noticed again how interesting Zuko’s character arc is–oh, I should warn you that there are spoilers ahead, though to be honest, it’s been eight years since the series ended and I think that ship has sailed, and also I knew a bit about people’s arcs going into the show and it did not ruin my enjoyment of it at all. For those that are unfamiliar with A:TLA, it’s a Nickelodeon show that ran in the mid-2000s about a world where the people are divided up into four people based on their element affiliation. Most people are normal people, but there are some who are “benders,” people who can manipulate their element in various ways. There’s one person at any time, the Avatar, who can manipulate all four elements: Earth, Fire, Air, and Water. When the Avatar dies, he or she is reincarnated into the next element in the cycle. In the time period that A:TLA takes place in, the Fire Nation attacked the others about a century ago, plunging the world into war. The Avatar, a 12-year-old airbender named Aang, accidentally got trapped in an iceberg, and avoided being wiped out by with the rest of the airbenders, who the Fire Nation destroyed, knowing that the Avatar would be an airbender since the previous one had been a firebender. So the series focuses on Aang and his need to master all four elements so he can face the Fire Lord and hopefully put the world back into balance. The bending worldbuilding is very good–they based each on a different martial art, and within each type of bending the movements are very consistent and logical. Earthbending, for example, features a lot of wide stances and grounding yourself; waterbending is fluid and moves quickly from form to form, etc. Perhaps the strongest thing about the show, though, is the characters. There are several main characters, and each are given a complex and reasonable backstory. None are treated are caricatures or stereotypes, and each have flaws and strengths like real people. Not only that, but major secondary and side characters are given the same treatment. Even Aang has understandable and relatable flaws despite his being the all-powerful Avatar. There’s five “main” characters: Aang; Katara, the last waterbender from the Southern Water Tribe; her brother, Sokka, who is the sole nonbender and functions as the tactical mastermind; Toph, a blind earthbender; and Zuko, crown prince of the Fire Nation. Sokka is probably my favorite, because he’s sarcastic and fun most of the time, but as I said above, I’ve always been fond of Zuko’s arc. Zuko starts off as the primary antagonist, hunting down Aang and leaving a swath of destruction to get to him. But the show makes it clear that he feels he has to–he was banished three years previously, at age 13, for talking back to a general during a war meeting, and his father told him that finding the Avatar was the only way he’d ever be allowed back home. Zuko’s stuck between his cruel father who’s determined to make the Fire Nation dominate the world, and his uncle, who preaches balance and kindness. Throughout the series, he’s forced to confront his beliefs and his past constantly, which is handled well and believably. In the end, he joins up with Aang and the others to help Aang master firebending and fights directly against his family to help put the world back into balance. I know from experience how hard it is to successfully take someone from a villain to a hero, so it’s interesting to see it done well. At no point does Zuko change his core personality, which is a nice touch. Anyway, if you haven’t seen A:TLA, you should watch it as an example of characterization done right. Yes, it’s meant for children, but they made the world and characters feel real, and put in plenty of complexity for adult viewers. It’s an easy watch too–the episodes run about 25 minutes, and there’s 20 to a season. All seasons are free to stream on Amazon, and I imagine it’s also available on other streaming services. Korra is also an excellent show, at least the parts I’ve seen, though much darker in tone. It’s obviously meant for a much older audience. Do you have other examples of TV shows or books that do a really excellent job with their characters? Thoughts on A:TLA if you’ve seen it? So, I got an email this morning from a semi-local school about doing an author talk to their kids in November, and it first it was like, Hey! Cool! Someone thinks I’m neat! But now that I’ve looked at it closer, it seems to be meant for another author (one who actually writes children’s books and so makes infinitely more sense than me, who writes mostly adult fantasy). So now I’m left to wondering–did they get the wrong email for a parent and/or teacher? Did they BCC a bunch of other authors in case the original one is not available and/or interested? Should I respond? Should I leave it be? And if I was just accidentally emailed, what are the odds that it be by someone local looking for someone of my profession? In other news, Turtleduck Press will again be taking up residence in the Author’s Row at MileHiCon in Denver, Colorado at the end of October. I shall be about for most/all of the weekend if you are a Coloradoan or close to Colorado and want books/sigs/landsquid, etc. In addition, TDP’s newest anthology, featuring space princesses (eeeeee), will be out on Nov 1, so we’ll probably have something special for that at the con. Or I’ll at least draw you a space princess if you bring something for me to draw on. Right, now that that’s done with, let’s talk about setting. Poor setting. I think it gets glossed over and forgotten by a lot of authors. I certainly used to be that way. What did it really matter where a story took place? Stick it in a generic school or forest or cruise boat and get on with the action and the mystery and the suspense, right? Luckily, I’ve learned better, though I will admit it took me longer than it should have. At first glance, setting seems like a backdrop. Just a stage for your story to take place on. I’d like to think that was me just being young and inexperienced, unaware of how different people could be from me and how people lived differently throughout the world. First off, characters. Characters are characters, right? What does setting have to do with them? Well, where your character grows up affects them as a person. Someone living in a crowded, rundown tenement is going to have different experiences and a different viewpoint than someone who was born on a spaceship and has never been planetside, than someone who grew up in a comfortable house in the countryside. People–and characters–are created by their environment, and your setting sets up a lot of a character’s background and, hence, their characterization. World is probably obvious. Your setting is part of your worldbuilding, along with language, customs, economy, geography, etc. But a society that lives high in the mountains and has to mine water from clouds is going to need different worldbuilding than a culture that lives in a bubble under the sea. Not only that, a well-thought out setting will have things unique to it, things that directly inform culture and society, and your world will seem richer and deeper when those things are pulled into your story. Plot! The great thing about setting is that sometimes it can pull in plot and subplot elements. Going back to the well-thought out setting mentioned above, the setting itself can provide inspiration for conflict, and not just the “Dear God, we’ve got to get over this mountain to the valley beyond where the only remaining magical healing plants grow,” though that’s certainly something to do with it. But if you’ve determined a resource is short, different groups of people could fight over it. Or your character needs something, but it’s only located in their enemy’s territory. Or your character is very tall yet all the doorways in your setting are very short, because the people who lived there memories ago only came up to your character’s chest. I’ve heard it said that your setting is almost another character, a living, breathing entity that grows and changes. So don’t skimp on your setting. It’s what makes your world real, what gives your story life. Thoughts on setting, Squiders? What do you think I should do about the school email? Yesterday was Star Trek’s 50th anniversary, Squiders! I find the date easy to remember, not only because I’ve been a lifelong Trekkie, but also because September 8th also happens to be my wedding anniversary. That was not on purpose. You’d think I could get my act together to actually post on the anniversary, but hey! This way I stand out from the crowd! A rebel, that’s me. Totally. A rebel. Anyway, Trek has been a major part of my life since it was little and has, in many ways, shaped me as an adult. Some of my earliest memories are watching original series reruns with my parents, and I went into engineering as a major in college in a large part because Geordi Laforge was my favorite character on Next Generation. I spent my teenaged years roleplaying Star Trek on AOL, testing out new characters and new situations, which I think helped my writing and creativity immensely (especially because I got my Mary Sue tendencies out there as opposed to the first novel I ever wrote). My mother recently moved out of my childhood home, so I had to confront the many belongings I’d left behind, which, to no one’s surprise, included ~50 Star Trek books, probably as many action figures, a model of the original Enterprise, an Enterprise-D engineering playset, a tricorder, a phaser…. I like science fiction but I adore Trek, and I think a lot of that is the generally optimistic mindset of the franchise. Even darker series like DS9 still hold the core belief that we are ultimately good and trying our best to do what’s right. (If you haven’t watched DS9, do.) I read a lot of original series books as a kid/teenager, and the strong friendship between Kirk, Spock and McCoy has always been very inspirational to me as well. So here’s to 50 years, the good, the bad, the ugly, and the silly. Keep on boldly going. For those of you who are following Siri’s and my long tour for City of Hope and Ruin (we’re giving away away a $50 Amazon giftcard), here are the stops since the last time I posted about it. We have three more stops, on the 15th, 22nd, and 29th, and then freedom! We’ve been getting lots of good response on the tour, but it doesn’t seem to be directly contributing to sales. Each tour stop has the blurb, one of a variety of excerpts, and giveaway info. Anyway, I hope your September is off to a good start, Squiders. Do anything fun to celebrate Star Trek’s 50th? Thoughts on Trek in general?